The latest Public Policy Polling survey does not bode well for Arizona’s junior senator Jeff Flake. In fact, after just 3 months in office Flake has already become one of the most unpopular senators in the country. We’d understand if Flake lost favor over his stance on granting amnesty to the at least 25 million illegal aliens who have invaded our country, but that’s not the reason for his decline. It’s no secret where Seeing Red AZ stands on Jeff Flake. We strongly supported conservative businessman Wil Cardon in his bid for the senate seat, open through Jon Kyl’s retirement. Our previous regard for Club for Growth fell to zero after the group ran vicious back-to-back, distortive, independent expenditure campaign ads intentionally misrepresenting Cardon. So imagine our plight as we find ourselves defending what we know to be his self-serving vote, parting company with mentor McCain on expanding background checks for gun purchases. For his vote, the República, which writes lengthy reports on bullying, again engages in name calling, this time calling Flake a “coward.” We were rapidly thrust back to our senses when finger-to-the-wind Flake vacillated the day after his vote. Flake flim-flamingly said he cast his nay vote because the language was “too broad.” Constitutionally-based conservative convictions never entered the picture. The raucous protestors outside his office, along with his “long time friend” Gabrielle Giffords and her hypocritical, carpetbagging husband Mark Kelly — who despite their friendship, have pledged they will support a senate challenger, have prompted Flake to now propose a “streamlined” version he hopes will win Congressional support. In appeasing the gun control advocates demanding he apologize for failing to support Barack Obama’s prized legislation restricting firearms, the aptly named Flake alienates conservatives who believe in the relevance of the Second Amendment of the Constitution. He’s lucky he doesn’t face the Republican voters he needs until 2018. The polling questions regarding Flake asked by the left-of-center — they call themselves “Democratic-leaning” — Public Policy Polling, run from page 3 through 7 of the 21 page report and can be viewed here. Their polling on the same topic also includes Alaska, Nevada, and Ohio. Recent polling tells the grim story of the underlying fear many Americans express about our government. For the first time since September 11, 2001, Americans are more fearful their government will abuse constitutional liberties than fail to keep its citizens safe. Following the terrorist attacks of 9/11, there was a dramatic reversal as 71% of Americans agreed to sacrifice personal freedom to reduce the threat of terrorism. Subsequent polls asking the same question in 2002, 2005 and 2006 found Americans consistently willing to give up freedom in exchange for security. There was a marked decline from 71% following 9/11 to only 54% by May 2006. Today it appears the sentiment expressed in Benjamin Franklin’s famous quote — “They who can give up essential liberty to obtain a little temporary safety, deserve neither liberty nor safety” — is more valued by Americans than it has been in over a dozen years. The poll found 48% of respondents worry the government will go too far, compared to 41% who worry it won’t go far enough. And similar to the Fox News poll, the Post found the worry to be a new development. Only 44% worried the government would go too far in January 2006 and only 27% expressed such concerns about governmental overreaches in January 2010. A troubling 51% of Democrats responded they would forfeit personal freedom to reduce the threat of terror, compared to 36% who opposed the concept. Forty-seven percent of Republicans opposed giving up freedoms, compared to only 43% in favor. Independents were the most resistant, with only 29% willing to sacrifice freedom, while 58% opposed losing constitutional rights. The Arizona Conservative Coalition’s (ACC) most recent legislator ratings, reflecting legislative actions as of 4/28/2013 is now available. Click here for the updated report. Be sure to take time to review Howard Levine’s informative weekly narrative, which provides background on the tracking process. The folks at ACC provide individual grades for Arizona’s Republican Representatives and Senators. There is quite a variation. This week the Senate ratings range from a high of 89.9 down to a bottom-dragging 47.7. In the House of Representatives the top scorer received a 95.2 with the bottom of the list rating a weak 47.8. Check out your elected members and hold them accountable with facts. They do such good work, after all. If you’ve read anything at all about the Kermit Gosnell infanticide trial, you’d realize why abortions are worthy of this president’s commendation. Not surprisingly, Barack Obama is the first sitting President to ever appear at such a gala. This event took place Friday in Washington, D.C. In its latest annual report, Planned Parenthood bragged that it performed 333,964 abortions in 2011 – a record year for the group. The abortion profiteers have received a record $542 million in taxpayer funding — in the form of government grants, contracts, and Medicaid reimbursements — according to a Susan B. Anthony List analysis of the report. The amount is 45 percent of Planned Parenthood’s annual revenue. Charlie Spiering writing for the Washington Examiner has more here. Earlier this week, as the nation was still reeling, trying to absorb the grisly aftermath of the Boston marathon bombings, Ann Coulter wrote a cogent column titled: The problem isn’t just illegal immigration, it’s legal immigration, too. Coulter’s fact-filled commentary is our “Weekend reading guaranteed to make you smarter” recommendation. Bob Beckel, ubitquitous liberal commentator and co-host of ‘The Five,’ appeared to catch his co-hosts off guard as he echoed similar thoughts. Beckel advocated for the temporary ending of student visas for foreign Muslim students as a means of combating homegrown terror. 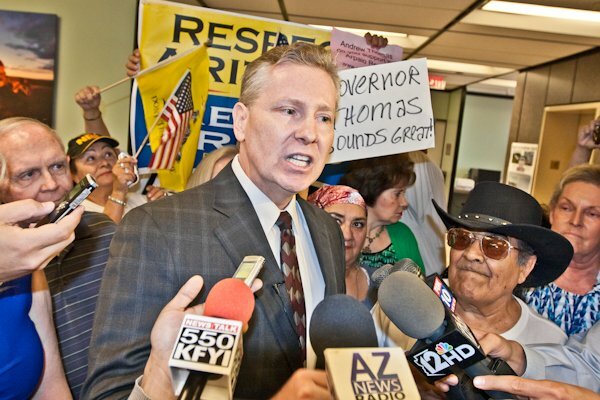 Former Maricopa County Attorney, now disbarred by the Arizona Supreme Court after a lengthy investigation into charges of abuse of power and unethical behavior,* has launched his campaign for Arizona governor. Here he is with his supporters Friday as he filed his intent to run with the office of the Arizona Secretary of State. 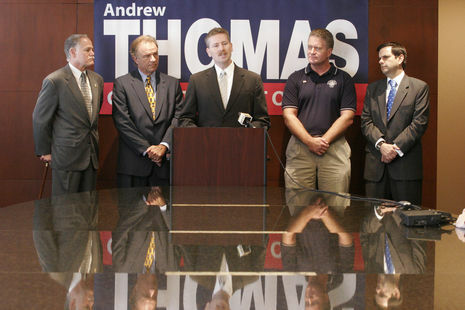 For a memory refresher, these Democrats and RINOs were Thomas’ supporters during his 2004 campaign. It remains to be seen if they will be onboard as advisors during his latest endeavor. Rick Romley, Grant Woods, Thomas, Billy Shields and Phil Gordon. *The Presiding Judge’s 247-page Disciplinary Opinion and Order Imposing Sanctions can be read here. Back in 2009, in a 5-4 vote, the U.S. Supreme Court took a major step toward ending what was then a 17-year legal battle in the Flores v. Arizona case. In their opinion, the justices wrote that lower courts erred by placing extraordinary focus on forcing Arizona to spend more money to assist English Language-Learner (ELL) students. Flores was sent back to the Ninth U.S. Circuit Court of Appeals with instructions to consider whether Arizona had complied with civil-rights law by improving both English-learner programs and K-12 education policies. The case was argued by Arizona’s then-Superintendent of Public Instruction, Tom Horne. He served in that capacity from 2003 – 2011. Horne was elected Arizona Attorney General in 2010. He and Jim Weiers, then-Speaker of the Arizona House were listed as petitioners. The majority opinion was issued by Justice Alito and joined by Chief Justice John Roberts and Justices Antonin Scalia, Anthony Kennedy and Clarence Thomas. Justice Stephen Breyer filed the 47-page dissenting opinion, joined by Justices Ruth Bader Ginsburg, John Paul Stevens and David Souter. If you’re so inclined, the Supreme Court’s 89-page opinion can be read here. Fast forward to 2013. The lawsuit has reached the ripe old age of 21. And whad’ya know? A federal court decision last month upholding the state’s English Language Learner programs is being appealed by Tim Hogan of the left-of-center Arizona Center for Law in the Public Interest. The case is now renamed Flores v. Huppenthal. Associate Justices Souter (replaced by Sonia Sotomayor) and John Paul Stevens (replaced by Elena Kagan) have retired. Today the State Superintendent of Public Instruction is fomer state senator John Huppenthal. He contends ELL students are making progress in the English program. Most test out of the program within three years. He believes the state will prevail in the lawsuit. The Center for Law in the Public Interest refers to itself as a “non-profit.” Obviously Hogan has been making a living from this long-in-the-tooth case. What’s the funding source? The daily’s coverage of this ongoing bonanza can be read here. You are currently browsing the Seeing Red AZ blog archives for April, 2013.